I'm not sure what happened today. I had the best of intentions to post it this morning, but here it is almost 5pm and I'm only just doing it. Frenzy Speciality Designer Series Paper. It's a shaker card with the Gold Glitter Flakes from the Occasions Catalogue. Shaker cards are really easy with the Foam Adhesive Strips. Cut the base from Tangerine Tango card stock 4 1/4" x 11". Fold in half. Cut a piece of Gold Foil Sheet 4" x 5 1/4". Adhere to the card base. Cut a piece of Foil Frenzy Specialty Designer Series Paper 3 3/4" x 5". Adhere to the card base. From Tangerine Tango card stock, cut out the 3" scalloped square using the Layering Squares Framelits. Cut out the middle using the 2 1/2" scalloped square. You can put both of the dies o the card stock at the same time to cut out the frame. Save the middle piece of card stock. Cut out a 2 7/8" square piece of Window Sheet. Adhere to the frame using a small amount of Snail. Attach Adhesive Foam Strips around the frame. Adhere the cut out middle piece of Tangerine Tango to the middle of the card base using Snail. Pour a small amount of glitter flakes in the middle of the card stock on the card base. Adhere the frame over top of the glitter flakes. 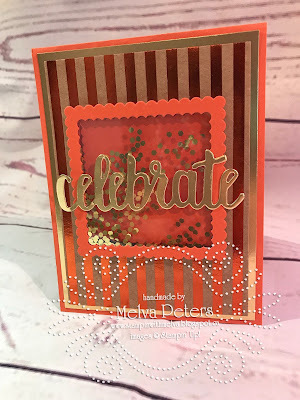 Cut out the "Celebrate" from a Gold Foil Sheet and adhere to the centre of the shaker using a small amount of Snail. TIP: If you have Snail showing around the edges of the letters, place the words face up on a silicone sheet and use the Adhesive remover to remove the excess Snail. Interested in making this card? We'll be making it in my upcoming Birthday Card Class on April 21st! You can register by clicking here. Check out my other classes and events as well! Lots planned for April and May!